Committee for a workers' International - Technology: Will robots end capitalism? Technology: Will robots end capitalism? A recent global survey, conducted by the accounting corporation Grant Thornton in 36 countries and among over 2,500 businesses, pointed out that an estimated majority of corporations (56% of those surveyed) already engage in efforts to “automate” jobs or intend to begin doing so within a year. Among industrial executives, there were the highest expectations that these projects will eventually lead to the replacement of at least 5% of jobs in their corporation. An Oxford study has suggested two years ago that almost half of contemporary jobs in the US could be computerized within less than 20 years. The accelerating trend of automation of labour poses a real new challenge to the working class and the socialist movement. Some among the Left have claimed that technological developments could lead deterministically to a gradual ascendance, beyond capitalist society. Other commentators, even from the capitalist press, prophesise an imminent global catastrophe. 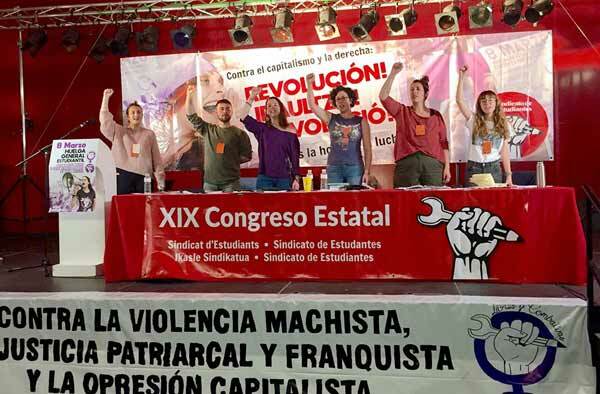 In this interview, Peter Taaffe, from the CWI International Secretariat and General Secretary of the Socialist Party (CWI in England and Wales), examines the processes that these different voices are trying to deal with, recognizes the potential dangers, but also emphatically rejects any one-sided utopian or dystopian perspective. The task of socialists is to offer a realistic way out of the immense crisis developing, he explains. Peter, from what to what is human society developing in our era? Well, it is developing from a capitalist society, which is wracked by a profound crisis throughout the world. Firstly, it is a global economic crisis, which began in 2007, and continues right up till today, despite the fact that the bourgeois economists and theoreticians talk about a recovery. It’s a very one-sided recovery, a joyless and a jobless recovery. It hasn’t solved the problems. There has been absolute growth, which has overcome the level in many countries of 2007–2008, but not at all a structural recovery. We have also a major political upheaval, a political crisis of the ruling class and their parties, who are split. It’s manifested clearly in the EU at the present time. And working people are compelled – in order to defend the living standards they have had in the past – to come out in opposition to this system. The attack on living standards comes hand in hand with severe social and environmental crises, and these increase the alienation of workers and youth from this system as well. This growing opposition is an expression, in our opinion, of a search for an alternative to this broken system, which in our view is a socialist alternative. This is based on the existing potential to free society from the dictatorship of ’the markets’ and to re-organize society democratically for the benefit of all. So in our era, socialist change will be on the agenda. It seems that the process of the automation of labour is entering a turbo-phase in our time, implying a future where human labour will be almost unnecessary. You have reviewed Jeremy Rifkin’s book, ’Zero Marginal Cost Society’, which deals with this trend, among other technological developments. To what extent do you think this process could develop and threaten jobs? Capitalism is the system par-excellence which has revolutionized the means of production. We’ve had the industrial revolution, which began in the 18th century – with the first industrial revolution, which was in the main the development of factory production. Later there was the second industrial revolution, which was mainly the development of motor-cars, electricity and so on, and which continued till the early parts of the 20th century. Since the late 20th century we have entered what Rifkin and others call the third industrial revolution (or the ‘Digital Revolution’), which has seen the shift to digital computer technology, cellular phones, the internet, 3D-printing techniques, developed robotics, etc. Now we are entering a phase where the pace of development is such that there are already some examples of fully automated factories, so-called ’lights-out’ manufacturing, where machines produce around the clock with no human intervention, and with the lights off. This will expand in America, in China and elsewhere. It is not just industrial jobs that are to be challenged by new technology. It is things like the medical professions, with robotics serving to assist doctors and nurses; in teaching professions, with the development of online teaching and so-on. It’s in all spheres of life that this will take place. How likely is it that new jobs will be able to compensate for all the jobs slashed by automation? Will the Greek and Spanish current levels of 25% unemployment become the new so-called norm for the richest capitalist countries? Should we expect a structural long-term mass unemployment, with a large part of the working class becoming a massive underclass? In China, which is currently the industrial hub of the world, already within the foreseeable future industrial jobs will be slaughtered by the mass introduction of robots. For instance, Foxconn (the manufacturer giant which produces the iPhone and employs over a million workers in China) has announced four years ago a plan to buy a million robots within three years to replace their human workers. So far, they’ve failed to do that (and even hired more workers last year), but they are adding 30,000 robots to their factories every year, and have effectually in the city of Chengdu, a completely automated factory. So in such a factory, the working class has already been done away with. In the previous industrial revolutions, new industries managed to absorb the agricultural population or the workers of previous industries. It is different now. This development is affecting not just the working class, but also the so-called middle-class occupations, which for example in America have been slaughtered by this process. You can have in San-Francisco, for example, one of the highest incomes per-head in the country, and then you can have a kind of impoverished substratum, including sections coming from the middle class. You can have, in places like the city of Baltimore, unemployment of over 50% in some neighbourhoods! This, is in a so-called recovery. The capitalists have always been concerned about the question of technology –whether it would result in mass unemployment. Even Keynes in the 1930’s tried to deal with this issue. He warned against ’technological unemployment’, but posed the possibility that by now, in the 21st century, capitalism would be able to absorb technology and cut the working week to 15 hours. Now we have new technology and the lengthening of the working week! The system does not manage to harness the new technology. We already have a massive underclass in Greece or in Spain at the present time, because of the effects of the present economic crisis, and the development of technique in industry could exacerbate structural long-term mass unemployment under capitalism. However, a most interesting thing about the present situation is that, in this era, there are more voices from within the system who warn of system failure and the possible repercussions of these developments. Some of them hold an apocalyptic view of what this would represent, even in the near future. Given their fear of the potential political repercussions of their apocalyptic vision, do you think some capitalist governments in this period could be propelled to intervene in the economy, not only to temporarily save banks, but to try to play a larger role in the running of the economy? A certain parallel should be drawn to Engels’ prediction from the 19th century about the "invading socialistic society" (’Socialism: Utopian and Scientific’, Chapter 3, 1880). What did he mean by that? That was on the basis of capitalism in the late 19th century. With a growing trend towards monopolisation, and influenced by economic crises, the capitalist state was being forced to take over the failing industries and nationalise them. We have seen a process of this kind in Britain, for example, in the aftermath of 1945, when the state took over 20–25% of the economy. The capitalists then were forced to adapt to the narrowed role of private capital. People like Harold Macmillan (British Conservative Prime Minister during 1957–1963) talked about a system of mixed economy, they didn’t talk about capitalism. Then, when the bureaucratisation of these industries proved inefficient and in the different political situation following the collapse of Stalinism, the capitalist class were eventually able to carry out mass privatisations. But eventually, this has been a disaster even from the point of view of the system itself. And now, the current deep crisis of the capitalist economy will likely propel some governments to take a similar trajectory (of nationalisations) at a later stage. What are the different solutions that some of those more critical liberal theoreticians put forward now for the aggravated contradictions created by technological development on the basis of the present capitalist system? There’s a section of the liberal intelligentsia and liberal economists who try to put forward their alternatives. One of whom is Rifkin, and another is a journalist called Paul Mason, who writes for the Guardian newspaper in Britain, and has just published an article to introduce his new book ’Postcapitalism: A guide to our future’. What Mason begins to touch upon is fascinating. He in fact agrees with us, agrees with a Marxist analysis, that the process of production is reducing the costs of the capitalists to zero or near-zero. As a result, the lifeblood of capitalism, which is profitability, will be sucked out of the system. You have already for instance, free goods on the internet like music. Pop groups nowadays don’t sell records, they don’t sell CDs – their music is free over the internet whether they like it or not, and they make their money through concerts, merchandise and so on. And that’s the way that information is going. Information is largely free. This includes TV broadcast streaming, downloads of TV programmes, films and so on. That is the way things are going. And now in the current new industrial revolution, we have 3D printers and the beginning of the realization of the dream of Marx, about machines which can produce machines (’The Fragment on Machines’, ’The Grundrisse’, Chapter 13, 1858). It is going from the boundaries of science-fiction to the boundaries of science. Incredible developments, and that’s just the beginning. You have the development of technique in every field. However, the argument that then comes forward is that because the industrial working class is being weakened, then what we have to look to is now no longer the working class, public ownership, democratic planning of the economy and a socialist transformation of society, but something else ’in between’. What Rifkin for example says is something in between. Yes, a post-capitalist society, based upon what Rifkin and Mason call ’the commons’. And the Commons is a concept borrowed from what happened in England in the transition from feudalism to capitalism, when there was a common land that capitalism destroyed. What they say now is that people are increasingly collaborating across the world, sharing their houses, sharing cars, etc. Driverless cars will come into being, and things will develop along these lines, of a "sharing economy". According to their logic, you do not need to overthrow capitalism: the Commons will allegedly just continue to grow within the wombs of capitalism, which will make capitalism be overcome with within 10, 15 or 20 years, or a bit later. This is a completely utopian perspective. There is a grain of truth in what they are saying, in the sense that they point to some actual and important developments in society. People are getting together, they are developing whatever technique exists, and they are sharing. Scientists, for instance, share – when they have an invention they don’t keep it to themselves. Big Pharma (pharmaceutical industry) does that, and that’s where we have a problem with Ebola for example. But the scientists share it with each other on the internet, not in pursuit of profit, but, generally speaking, in order to benefit human kind. And that is fantastic. However, capitalism comes in and colonises this, enforcing commercialisation of everything, including the internet. And at the same time, fearing a social revolution, there’s also a political curbing on free internet. That’s shown by China’s very effective firewall and so on. This idea about creating this alternative society which will gradually replace capitalism is really a modern version of the idea of 19th century utopian socialist, Robert Owen, regarding model colonies that would gradually encroach on capitalism. They were islands of socialism if you like, or islands of planning. But it was an attempt to change society behind the backs of society, and it was in an ocean of capitalism. And like with this example and with the so-called mixed economy, the laws of capitalism inevitably conquer such islands of socialism and pervert the original ideas of cooperation and the Commons. Absolutely. It’s a new form of reformism. Through these methods you do not need to confront the capitalist class, it will allegedly be won over by the powerful example of the commons and the collaboration at the bottom. It is a childish concept! It is absurd to think, for example, that by the development of sharing economic projects you could overthrow the Israeli capitalist ruling class, particularly with its enormous military power, with its high technique, etc. Paul Mason claims that in Greece and elsewhere, the Left is old-fashioned. According to him, the Left is stuck in a 20th century outdated concept that the working class should be taking power in order to lead an allegedly top-down economic and social change. We don’t believe that. We believe that a central economic plan must be democratic and must be controlled actively from bottom-up and be accompanied by local democratic planning, decision-making and so on. Now the irony is that some of the best brains of capitalism are asking profound questions which challenge the very basis of capitalism, and they pose the question of what is the alternative, but they do not really put forward a clear alternative economic system. Engels was right when he described an invading socialist society in the late 19th century. The material basis for a new society exists, but in order to realize such a transformation you have to overthrow the capitalist class. And the only way to do that is through a socialist revolution, mobilizing the industrial proletariat or what remains of it, and the new semi-proletarian and proletarian sectors, including the so-called ’precariat’ layer of workers in highly precarious jobs across different sectors. We have a new proletariat now, in services but also in hi-tech industries. We have a white-collar proletariat and semi-proletarian layers. We have a hi-tech proletariat. Some of them are paid below average rate. And it is important to point out that the development of these layers is not a hindering factor to socialist change. The example of Seattle, one of the hi-tech capitals of the world, illustrates this with the election of the first socialist councillor for a hundred years. These new layers of workers are and will increasingly be subjected to the pressure of the class struggle in this era, and they will resort to the methods of the working class, like joining trade unions, organising combative strikes, and so on. So will the unions go through a mass revival? Yes, the unions will revive. Not just among the working class, but even among sectors of the middle class, who in America are being thrown into the pit of low pay, of insecurity etc. Their sons and daughters will never have the living standards that they have had. There will be significant movements, and in various sectors the unions will fill-up and will re-develop. At the same time, the longer-term weakening of the industrial proletariat particularly raises the question of us appealing not just to the working class but to layers of people coming from the petty-bourgeoisie and even from the bourgeoisie. The sons and daughters of the bourgeoisie, who are conscious of what’s developing in society, will look around for an alternative. A certain part of those layers, though not the majority, could be won over to the grandiose perspective of a new society which can harness technology. That is why one important aspect of our struggle is to reach students in the universities, but also Left intellectuals, scientists, futurologists. If they are won over from that milieu, and commit to the stand point of the mass of the working class, they could play a prominent role as yeast for the working class movement, particularly in this era. Movements of the character of Occupy and the Indignados, involving these elements, are generally an anticipation for the working class moving in its millions. Do you think that despite the massive throw back of class and socialist consciousness over recent decades, the modern working class in those increasingly de-industrialized countries and also in China, could be pushed by history to an independent mass political struggle? Could it be pushed to organise in militant and eventually revolutionary parties? Yes. I think that is still the correct perspective. Paul Mason’s trend does not understand what happened after the collapse of Stalinism. He simply notes the Left has been ripped and thrown back. But why? You have to ask why. The throwback of consciousness did not fall from the sky. The collapse of the planned economy – which was a reference point for the working class internationally despite the bureaucracy and totalitarian regime – was used to facilitate an onslaught by the capitalists against the working class. Former working-class parties turned to the right, with their pro-capitalist leaderships completely adopting the neoliberal logic and the propaganda that there can be nothing better than capitalism. Revolution is the locomotive of history. Counter-revolution, even ideological counter-revolution, plays the role of an enormous break, of throwing consciousness back. But this doesn’t change the fact that the triumphant capitalist system has gone through one of the most extraordinary collapses globally, second only to what we saw in the 1930s. In recent years, we have experienced the world recession. The effects of that have not completely been burnt out of the system, and capitalist economists themselves warn now of a new crisis already on the horizon. That crisis is going to be even deeper, starting from a much worse economic position. Working class and middle class layers have suffered heavy blows in living and working conditions in many countries in recent years. There is growing political ferment and upheaval. In a series of countries there’s a clear rejection of capitalist parties, and a search for an alternative. Against the background of this, we’ve seen already the setting up of various new political formations on the Left. Syriza was a marginal force in Greece just a few years ago, but they won mass support and were pushed to power because they were believed to represent an alternative to austerity. We see even within the frameworks of the capitalist neo-liberal Democratic Party in the US and the Labour Party in Britain, the examples of Sanders and Corbyn, who get an immense popular echo, even for limited pro-working-class rhetoric. In South Africa, the populist EFF has managed temporarily to step into the vacuum on the Left, as working class layers look for a way out of the capitalist misery imposed by ANC rule. There are several different experiences from recent years that, while showing the political weaknesses of different political forces, also reflect a concrete potential based on the thirst for change and for a political alternative. This process will accelerate, influenced by major social movements. But it is only on the basis of a socialist programme that clear solutions and a clear alternative could be posed. Therefore, socialists have an important task to assist in this process of organizing and political clarification. The road to new mass socialist parties will open again in coming years. Going back to technological developments, Stephen Hawking warned recently of an existential danger posed by potentially highly developed Artificial Intelligence. Would you agree with that? Such a danger exists. Generally, technology can be used in two ways. It can open up a new vista for human kind, or it can open up a nightmare. Now they are talking, for example, about training autonomous killer robots, and wars where each side has killer-robots, they fight it out, and whichever section of the killer-robots comes out, they’ve won the war. This is a grotesque image of the way technology is being developed in the context of a sick, crisis-ridden, capitalist society. The different technologies could really be great tools for a new and better society, but only if we liberate the productive forces from the stranglehold of private ownership on the one hand and the nation-state on another. Stephen Hawking is of course right that unharnessed technology, in the wrong hands, by some sections of ruling classes, uncontrolled by society, such as some types of dictatorial regimes, could be a very dangerous thing. But apart from that, Hawking is raising another point. There is the danger of that. Maybe I couldn’t give you a timescale; I won’t be around by then. So I will not have to deal with the consequences of that question. However, humanity’s posterity will be much more intelligent than us as well. There was an article in the Financial Times earlier in July, in which they postulated a post-human future for the world, and for the other galaxies out there (’Cheer up, the post-human era is dawning’, Martin Rees, 10-July). In other words, the soft wet brain that we’ve developed – as part of the biosphere which exists in a belt of about 22 kilometers between the earth and the air – would possibly be matched and superseded by the development of robotics. This seems fantastical to us, because we have developed for millions of years. However, such future intelligent robots (or human-like androids), at least for a considerable time, will not have the same sensitivities that we have, to weigh up situations in the same terms we do. For instance, you employ a robot to take out a terrorist in a building, and it has to apply logic, so it sees the terrorist around the third floor, and some one-sided formal logic might very well lead it to the conclusion that the only way is to blow up the building and kill everybody in it. That could be their primitive thought processes. It is a question of posterity, who will be much more intelligent. Our job in our life time is to defeat capitalism, to establish the first days of socialism, the transition from capitalism to socialism with a democratic workers’ state, and starting socialism on a higher level of technique then anywhere in the world today. Then we have the problems of the inheritance from capitalism, and of establishing a harmonious planned economy. What a future socialist society will precisely look like we cannot describe now. We can make necessary warnings, but at the same time, we are optimistic that human kind will find a way. In what way will socialist transformation help to control technological risks? Who would guard the guardians? Who would control the scientists? Human kind will need to resolve these questions through democratic discussions and debates, involving whole schools of theoreticians. The classes will disappear, the class-struggle will disappear, but that doesn’t mean to say that it will be a society of lotus-eaters who are lying back and just eating dates. There will be intense battles and struggles over ideas, including this idea of what kind of future society is necessary. Will the robots have a higher intelligence than us? From a logical point of view there is no reason to say no. Will they have the same sensitivity and feelings as us? Well, I don’t rule that out, but the question is, will the robots come into collision with human kind or will we be able to collaborate with them? The word Robot comes originally from a word with a similar meaning to slave (from Czech, ’Robota’ – serf-labour, drudgery). So will our slaves revolt? Will there be a new Spartacus? Will there be a new slaves’ revolt which will overthrow human kind, or will we develop alongside of these machines, in a harmonious relationship and conquer the planets?